We are the Manufacturer and Exporter of wide range of water pumps in Coimbatore. Our water pumps, which have excellent resistance power, are exclusively used in various fields which include construction, farm, industry, domestic etc. Our unrivaled water pumps proffer high operating efficiency. Based on custom-built designs, our water pumps are fully efficient to face any voltage fluctuation. Storage tank filling from well. Range : 0.5 HP to 1.0 HP 1 Phase, 2900 RPM Capacity : 30 LPM - 2500 LPM Total Head : 6.0 to 50 Mtrs. 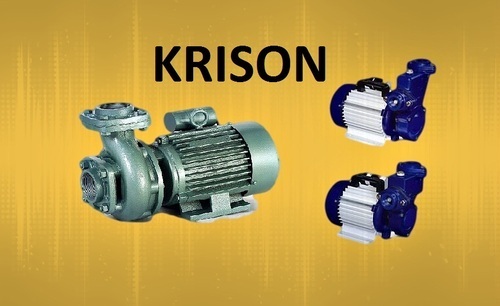 KRISON EXPORTS has come into market to offer excellent array of products to its valued client in market. The organization is a partnership concern which came into inception in the year 2013 as a trader and supplier of water pumps under the brand name FINE ALPHA and also exporters of dry Red Chillies. Krison exports now once again stepped into world market to offer fine quality of Dry Red Chillies. Red chillies have always remained an integral part of food preparation in our country and we ensure to offer best quality which is well known for its taste and aroma. We as a trader are putting excellent efforts in ensuring to offer the best products in market with various kinds of red chillies and ensuring better customer experience. We have been working consistently in ensuring a quality centric range to our clients. Above all we maintain the most competitive Price line offered to our clients globally. We are counted among the most prominent manufacturers, suppliers, distributors, wholesalers and exporters of Red Chillies. We are looking for Forgein Enquery.